Welcome To Your Guide To The Best Hamster Food For Syrian Or Dwarf Hamsters. 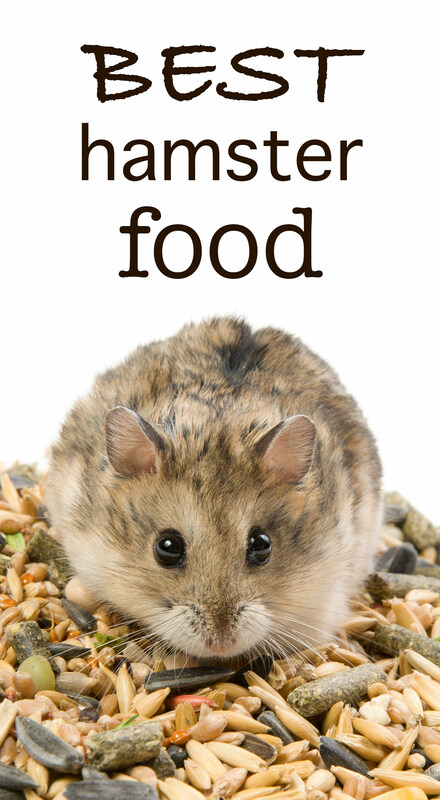 Including Tips For Feeding Diabetic Hamsters, And Finding The Healthiest Hamster Food For Your Furry Friend. Hamsters may be small, but don’t be fooled. These tiny fur balls love to eat! When it comes to hamster food, it’s important that your pet gets something tasty that he likes to nibble. But it’s also important that you give him the nutrition he needs to live a long, healthy and happy life. The best hamster food is both nutritious and delicious! You can find out more about these and several other brands in the article below. If you’re wondering what the best option is for your tiny friend, don’t worry. We have plenty of suggestions in this ultimate hamster food list. Whether you’re looking at hamster food pellets, or hamster food mix. Or simply searching for good hamster food at a good price, we can help. The guide below tells you everything you need to know about the best hamster food diet. What is the best hamster food? Hamsters have a lot of energy, and a high metabolism. This means the small rodents need plenty of food to fuel their playing, digging, burrowing and other activities. However, hamsters will eat everything put in front of them so don’t continually refill their bowl. Thanks to their keen appetite, hamsters can easily get overweight which may lead to further health problems. The Humane Society of the United States advises feeding your hamster just one tablespoon of pellets or seed mix a day, in addition to sporadic treats. The best hamster food is one that your hamster enjoys, and that provides all the vitamins and minerals he needs. It should contain a balance of protein, fat and carbohydrate. In the wild, hamsters eat a mix of seeds, cereal grains and insects. But thankfully you won’t have to forage for these to make sure your hamster gets what he needs! There are many hamster food brands out there that will fit the bill, but be aware that your hamster’s feeding requirements may differ depending on his size and species. There are around 24 different species of hamster, but the most common pets are Dwarf hamsters and Syrian Hamsters. As their name suggests, Dwarf hamsters are among the smallest type of hamsters. These tiny rodents measure just 2 to 3 inches in length. Despite their small size, Dwarf hamsters require just as much food as their Syrian cousins. This is because they are extremely active and burn through their food quickly. There are several different types of Dwarf hamster, including the Russian Dwarf hamster and the Roborovski Dwarf hamster (also known as the Robo Dwarf). Dwarf hamsters are more prone to diabetes than Syrian hamsters, because they cannot break down sugars as easily. As a result, their diet requires careful monitoring. The best dwarf hamster food is low in refined sugars. It should also be low in fat and high in protein. Dwarf hamsters especially love small bird seeds such as millet, linseed and budgie tonic seeds so it might be worth seeing if your local pet store carries these. If you’re looking for Robo dwarf hamster food, Oxbow hamster food is a popular choice. Its Animal Health brand contains timothy hay, oats and barley so your pet can nibble happily. Unlike many other brands, it does not contain dried fruit so your hamster’s blood sugar won’t be affected. Russian dwarf hamsters are sure to love Hazel hamster food. The Tiny Friends Farm Tasty Mix has no added sugar. It is also high in protein and low in fat, containing sunflower seeds and peanuts. If you’re in the UK or elsewhere in Europe, this product is known as Harry hamster food, rather than Hazel. Squeaks and Nibbles’ own Chinese hamster, Princess, is a big fan of this brand! Vitakraft makes a formula specifically for dwarf hamsters. This hamster food includes vitamins A and E and calcium to make sure your furry friend gets a balanced diet. Syrian hamsters, or Golden hamsters, originated from Turkey and Syria. They are commonly between 5 and 7 inches long. 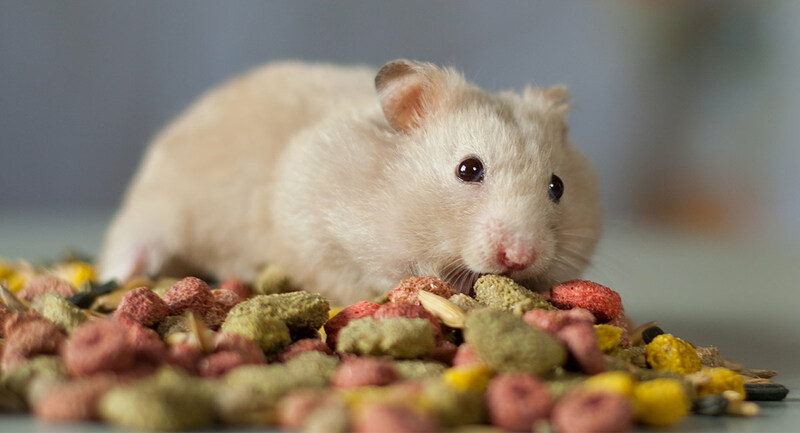 Like all hamsters, they love to gnaw and do best with a dry food diet that keeps their teeth and digestion in great shape. Kaytee hamster food is another great choice for Syrian hamsters, especially their Fiesta product. It is a mix of healthy fruits, vegetables and seeds. Higgins Sunburst Gourmet Food Mix is made in the USA, and has no artificial colors or preservatives. It contains dried fruit, seeds, nuts and legumes. It is also fortified with a range of vitamins and minerals. Tropical Carnival Gourmet Food has beneficial bacteria to boost your hamster’s digestion. It is specially formulated for all types of hamsters and is a mixture of fruit, veggies and seeds. Hamsters generally live for around two years. The best food and care can help keep them active and healthy throughout all stages of their life. Kaytee Forti-Diet Pro Health mix is a complete hamster food that contains everything your hamster needs as it develops. Rich in antioxidants and fibre, it aims to improve your pet’s brain and heart health, as well as his immune system and coat. Hartz Bonzanza Gourmet food comes in a ‘Healthy and Vitality’ blend that features some unusual ingredients. This mix contains a number of exotic fruits such as papaya and banana. It also includes peanuts, peas and hard pellets, to keep your pet’s teeth healthy. Ten different varieties of real fruits and vegetables are found in Carefresh’s Complete Menu mix. Apples, carrots, spinach and peas are combined with crunchy pellets to provide your hamster with fresh, natural ingredients. Diabetes is unfortunately a common problem among hamsters. Chinese hamsters can have diabetes symptoms ranging from mild to severe. Hamsters suffering from this disease do not produce enough insulin to break down glucose, meaning that they have trouble stabilising their blood sugar. This can lead to heart problems, kidney failure and blindness. 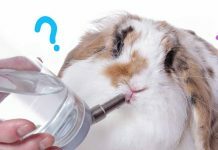 Symptoms of diabetes in hamsters include frequent urination, excessive thirst, lethargy and hyperactivity. Always take your hamster to your vet if you are concerned about his health. Diabetes can be easily tested and treated. It’s important to keep sugar out of your diabetic hamster’s diet. While there are no commercial foods specifically formulated for diabetic hamsters, some brands do have low-sugar options. Brown’s Tropical Carnival Select Seeds contains no added sugar. However it is just seeds so you may need to supplement other foods to make sure your hamster is getting a balanced diet. One study has demonstrated that diabetes in a group of Chinese hamsters was significantly reduced in terms of onset and severity when they were fed a limited diet. To really ensure you control your diabetic hamster’s diet, try feeding them whole foods. They can eat a range of vegetables including cauliflower, kale and peas. Just be sure to avoid fruits and vegetables high in natural sugar such as carrots, potatoes and corn. For protein, you can feed your hamster cooked chicken or turkey, mealworms or scrambled eggs. You might also like to try giving hamsters dog biscuits for something to gnaw on, as well as walnuts, hazelnuts and brazil nuts. They will also need fibre, in the form of seeds, grains and grass. If your hamster is diabetic and you want to develop your own feeding plan using whole foods, be sure to discuss it with your vet first to ensure your hamster gets optimal nutrition. How much is hamster food? To get the best price for your hamster food, it’s best to buy in bulk. 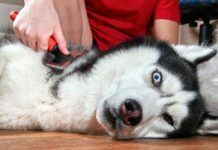 Pet stores generally offer better value if you buy in quantity. And, if stored correctly, there’s no reason why your hamster’s food can’t last a long time. For further savings, you can also consider supplementing your hamster’s diet with scraps from your own cupboards. 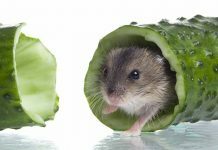 Hamsters enjoy many ‘human’ foods such as cucumber, broccoli and celery. But never feed them citrus fruit, chocolate, uncooked beans or onions, as this can upset their stomachs. Give your hamster his food in a flat or shallow dish, and also provide plenty of fresh, clean water. Introduce any new foods slowly as it may take your cute critter time to adjust to a new diet. Hamsters do best on a varied diet that not only meets their nutritional needs, but also satisfies their natural tendency to gnaw and nibble. The best hamster food will provide this in one packet, with you just adding in extra treats and chew toys for added fun and stimulation. Choose a dry food that suits your pet’s dietary needs and taste buds. Gerritsen 1982 The Chinese Hamster as a Model for the Study of Diabetes Mellitus. American Diabetes Association. Previous articleCan Guinea Pigs Eat Watermelon?